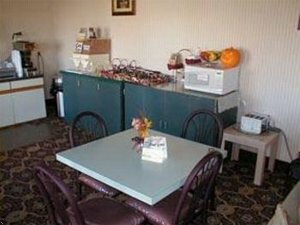 The Econo Lodge is ideally located within walking distance of Mountain View Golf Course. Outdoor enthusiasts will love the recreational activities the nearby Wylie Mountains, Sierra Diablo Mountains and Rio Grande River offer. Just a few minutes from this Van Horn hotel, the Red Rock Ranch offers tours and guided hikes of the surrounding desert landscape. Travelers will enjoy visiting the Culberson County Historical Museum, formerly the Clark Hotel, which serviced the railroad clientele of the past. The hotel is located in the downtown area, where restaurants and shopping are plentiful. Pet Accommodation: 10.00 USD per night per night. Pet Limit: 2 pets per room. 50 pounds and under. From I-10 East: Take exit 138, left on overpass to Broadway. Hotel 1/2 mile on right. From I-10 West: Take exit 140B, right at stop sign onto Broadway Street. Hotel 2 miles on left.